The effective methods of teaching the dog to be calm and quiet with the people passing by, cyclists and passing cars. For sure many dog lovers and dog owners time after time are facing such a common problem, as excessive "love" of your pet for catching cyclists, chasing cars or biting the jogger's heels. No use to say that sometimes it may bring the dog's owner to the boiling point. What can you do about it? There is only one correct answer: it is necessary to teach your dog some self-control. This article is describing one of the methods of teaching a dog this, to say frankly not a very easy, matter. So, you will need: the owner (one person), the owner's assistant, it is desirable that this person will not be familiar to the dog (as a start one person will be enough, then it is desirable to increase the number of the people, participating in this training). Also you will need a big amount of delicacies as a reward, something that the dog eats seldom, but she likes it most (pieces of cheese, sausage, meat and dry food). Venue of classes: a deserted place, preferably with no other people and any distracting your dog or your items. So, now you can start the phased training. Ask your partner to escape from the dog's sight and only appear on your signal, then say the command "Come here" and when the dog is beside you, give a treat. While the dog enjoys the treats, give a signal for your partner to appear in sight, he should not come close, and make only 20-30 seconds of walking, so that the dog saw him, and then he should again disappear from your sight. Such an artless exercise should be repeated 2-3 times - not less. When you proceed to the second stage do not forget to repeat the first stage once again, and only then proceed to the next steps. At this time, ask your assistant to jog in the dog's sight for about 10 seconds. When the dog just noticed the jogging man, immediately give the order "Come here", without waiting for your dog to even think that it is not so bad to catch this athlete. If the dog came up, praise and give treats. Repeat this several times, and then give the dog a rest: a game with the ball or with the stick will do, or you may just let your pet to walk free around the neighborhood. When the dog comes to you unconditionally and not trying to catch your partner, you can start into the next step. BUT: never go to the next stage of training until you are sure that the recent skills are well remembered by your dog and performed without any misfires. Let your partner now to run a little faster in the field of view of a dog, but not yet approaching it at a close distance, and give the command, and then treat. Repeat the exercise 3-4 times and then again release the dog to rest. Repeat the previous steps and make sure that you have achieved an excellent behavior of your pet. Now start cutting the distance between the dog and your partner. As a start you can shorten the distance to 20 meters, then up to 10 meters, when the dog will study to return to you on your command immediately, the distance can be shortened to 3 - 5 meters. Perfect results of the command "Come here" when the stranger is running around your dog may take weeks and sometimes months, but if you will do everything calmly and firmly, the good results will certainly appear. There is no need to rush things, explicitly model each stage with your dog. Ask a few people who are not very familiar with the dog, to help you, and repeat all previously passed stages, if such volunteers are hard to find, you can work out the elements of training in a public park or public garden. When the dog have a calm reaction to the jogging people, you can be congratulated, you have succeeded. Never yell at your dog if it does not clearly respond to the command. You may be too fast, and the dog is losing self-control. Remember the training is a hard work, but the future results will certainly please you. 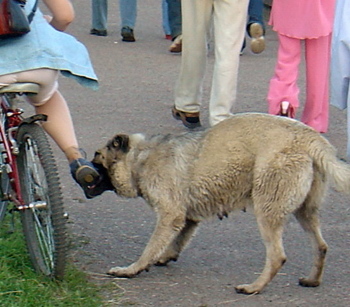 The same technique can be used for training the dog to react calmly to the cyclists and cars, however, it is recommended to start with the stage of a jogging people, then it will be much easier for your dog to calmly respond to the bike or car. It will already be a reflex of how to behave in this situation. These skills will help to keep your life calm and easy, and possibly even to save the life of your pet, because now in the situations where the cyclist or the car will be close to your dog, she will know what to do, she will come to you instead of barking, scaring the cyclist and pedestrians or getting tangled under the wheels of cars. Be patient and instead of the four-legged little devil you will finally have a perfectly well trained dog, which is a great pleasure to own.